Baseball coverage again this season on www.collegecasts.com. Look for games on Friday evenings on the Prepcasts Broadcasting Network. Also look for the All Star Game on 7.11.16 from Ballwin and the entire Playoff Season from 7.13.16 to 7.22.16. Busekrus (Trojans) got things started for the Metro Collegiate American team, hitting a hard liner up the middle for a base hit. He was later moved into scoring position on a single from Matt Brown (Bandits) and both came around to score on a double from second baseman Dan Mannion (Bandits). The score remained 2-0 in the American Team’s favor until Busekrus came up again in the second inning. With two runners on and two outs, Busekrus sent a pitch high over the centerfield wall, extending the teams lead to 5-0. Busekrus finished the game 2-3 with 3 RBIs. This season he led the league with 30 RBIs, a .463 batting average and was tied for second in the league with 5 homers. After exiting the game in the fourth, Busekrus was honored for his MVP selection by receiving a special Stan “The Man” Musial pin, sponsored and designed by world renowned sculptor Don Wiegand and his Wiegand Foundation. The pin was presented by Baseball Commissioner, Bob Totterer, League President, Marty Stein and Brian Schwarze. Schwarze is a former Metro Collegiate League and professional player, but and also the grandson of Stan Musial. Schwarze remembered when his grandfather used to come and watch him play during his time with the Metro League and how much both of them enjoyed that time together. “To say my grandfather loved this game would be an understatement,” said Schwarze. The American Team eventually went on to win the game 10-2 in front of an absolutely packed house at this 37th Annual renewal of the St. Louis Metro Collegiate All-Star game. The first round for the Metro Collegiate Playoffs are happening this week with the Kats taking on the Dodgers and the Trojans taking on the Bandits. My favorite part was probably getting around the other guys from the other teams, kind of getting to know them, it was just nice playing with guys from different school and coming together for one night. It was a lot of fun. This summer I’ve had a bunch of people come up and ask me about my stance and I really don’t have an answer for it. I‘ve always been a guy that doesn’t stride with my front leg but it’s just all about comfort for me. I just try to keep things pretty simple at the plate. It’s just all about comfort for me. I know it looks different and it’s unique, but it’s comfortable for me. Just be aggressive with your approach. You have to go up there with an approach before the game and know what type of hitter you are. I’m the type of hitter that is aggressive early in the count. Most of the time I’m looking for a lot of fast balls early in the count and trying to be aggressive. My favorite part this summer was getting to play with a lot of guys from my school’s team at UMSL. We had a lot of guys on our Trojans team this summer so it was nice to play with them more and build our team chemistry for the fall and the upcoming spring. It’s definitely in the back of your mind when using a wood bat. I’ve broke two this summer so…As far as my approach, no it not going to change my approach to the plate. We need to just keep continuing what we’ve been doing all summer. Our pitchers have done really well and we’ve had really good defense for the most part. We always seem to have 1 or 2 big innings during the course of our games and then we just kind of cruise after that. I think we need to keep playing the way we’ve been playing and I think we’ll be fine. Tyler Branneky, a junior from Westminster College and four-year Metro Collegiate Player, was named the St. Louis Intercollegiate Athletic Conference (SLIAC) Baseball Player of the Year for 2015. Branneky led the Westminster Blue Jays with a .413 batting average and broke the school’s RBI single-season record with 45. He also tied the school’s career triple record with eight, six of which came during the 2015 season. Westminster finished the year with a 24-12 record, going 16-6 in SLIAC conference play. Branneky was later selected to the American Baseball Coaches Association (ABCA)/Rawlings NCAA Division III Central All-Region 2nd Team. In addition to his success on the baseball field, Tyler has been on the Dean’s List at Westminster and this summer is working an internship for the St. Louis Cardinals. Last year with the Metro Collegiate Knights, Branneky batted .346 (18-52) with 12 RBIs in 18 games. He has been coached by ex-Big Leaguers, Lonnie Maclin, and Ken Reitz in Metro Collegiate Baseball and by Scott Cooper on hitting since 8th grade. However, despite Branneky’s success at the plate, the hitter says he does take a slightly different approach when playing in the Metro League. The third-baseman represented the National Team in the 2014 St. Louis Metro Collegiate Baseball League’s annual All-Star Game. Branneky is currently playing for the Metro Collegiate Trojans and will play his final season at Westminster College next spring. St. Louis Metro Collegiate League alum, Tate Matheny was selected by the Boston Red Sox in the fourth round (111th overall) of the 2015 Major League Baseball First-Year Player Draft. 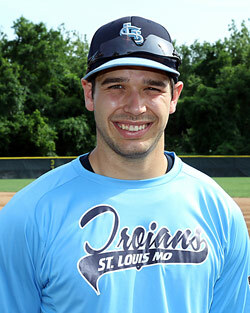 Matheny joined the Metro Collegiate Knights during the 2012 season following his senior year at Westminster Christian Academy. The Knights were coached that summer by two former MLB players, Lonnie Maclin and Kenny Reitz. The outfielder finished the season with a .423 average (11-26) and later went on to Missouri State University. 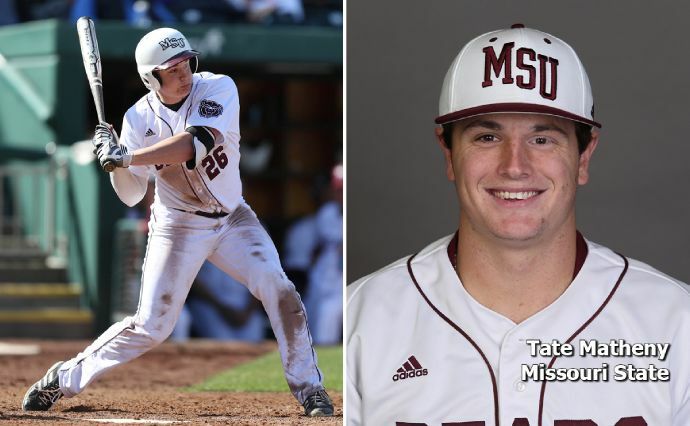 There he was voted MSU’s Team MVP and Freshman All-American by Baseball America and Collegiate Baseball. Matheny was named All-Missouri Valley Conference all three seasons with the Bears and was First-Team All-MVC the last two. “He’s close to a five tool player. He’s got good speed, good arm, good power…he’s got it all,” said former Knights coach and Major Leaguer Lonnie Maclin. Matheny is the son of St. Louis Cardinal’s Manager, Mike Matheny. Mike Matheny played Major League Baseball for 13 seasons (five with the Cardinals) before becoming the Cardinals Manager in 2012. For the past two summers, C.J. Bilbrey served as the head coach for the Explorers, which played in another college-age league. There he led his team to an overall 47-22 record, winning the league championship in 2013. This season Bilbrey has joined forces with Harris-Stowe State University colleague (and Metro Alumnus) Dave Estes, to serve as co-coaches for the Metro Collegiate Green Sox. Although the two didn’t start coaching together until 2014, they played together on Harris-Stowe’s team for two seasons. Estes has just concluded his seventh season as the head coach and Bilbrey his second season as assistant coach for the Hornets, prior to making their coaching debut with the Metro League on June 1. Yes you are, coach. Good luck this season and welcome to the St. Louis Metro Collegiate Baseball League. 1980 Metro League Champions, St. Charles Travelers. 1980 was the first year for a St. Charles team in the league. Red Jerseys, caps and stirrups with white pants. This photo was taken down the 3rd base line at C&H Ballpark, our home field. That year the St. Charles Travelers’ record was 25 wins, 0 losses. They were pretty stacked with talent, and even had 4 players drafted from that team. 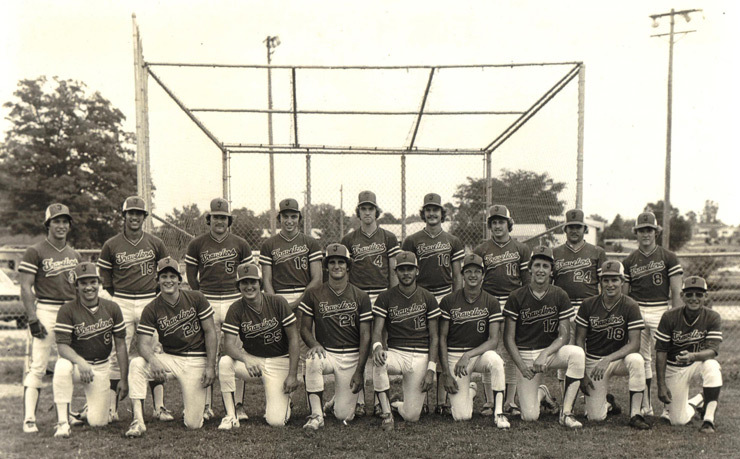 In 1980 there were 9 teams including, St. Charles Travelers, St. Louis Browns, West County Royals, North County Dodgers, South County Indians, St. Louis Cubs, Brentwood Yankees, Alton Optimists, and a team that was based in Braggadocio, MO at Don Kessinger’s baseball facilities. Every St. Louis area team would make one weekend trip to Braggacocio to play 3 games, the first of which counted for league play. The St. Louis Metro Collegiate Baseball League consists of exceptional players between the ages of 19-22 recruited from the greater metropolitan area. The Metro League is proud to report that 90% of players are attending college on athletic or academic scholarships. In order to sharpen the skills of our players, provide better context for their performance and give ourselves a professional look, The Metro League exclusively uses wooden bats. We are a franchise of the NABF and send a team to post-season play through the NABF each season. The Metro Collegians Instructional League was formed by ex-professional baseball players, Major League Scouts and area college and high school coaches with the intent to instruct boys at all age levels in the fundamentals of baseball. The Metro League conducts baseball clinics throughout the year for coaches, boys and girls in all age groups up to the age of 22. Defensive miscues would prove to be the difference in a well-pitched game by both sides, but with the Dodgers prevailing over the #1 seed Bandits 5-1 to capture the 2014 Metro Collegiate League Championship. The Bandits would make 3 fielding errors in the first 2 innings that led directly to the Dodgers 1st two runs. The Dodgers would pick up back-to-back doubles by Mark Henken and Pete Spradlin in the 3rd to go up 3-0. Lex Kaplan would deliver a 2-run double in the 8th to give a cushion to the big star of the night, pitcher Mike Lydonlorson. The Dodgers and the Bandits now head to Toledo, OH for the National Amateur Baseball Federation Tournament. The Dodgers are the defending champs.